On your table wall, place a secure container (I use a medium crate) that sits on top the table next to the trash barrel. This cannot be opened or looked in by anyone but Friends, Co-Owners, and Owners. Put an axe inside that secure crate. You can double click the axe inside the crate (never removing it) and click the trash barrel, step forward one tile, new trash barrel. Done. Way faster than a macro to move a table for you. Way simpler as well. Completely secure and safe. Friends cannot even axe the trash barrel to begin with. The worse thing a friend can do is steal the axe out of the secure crate. This crate also acts doubly as a quick-drop off point for things if you don't wish to go all the way into the house at that particular time, but need to drop something off that you will sort off later. Again, secure containers are safe from being looted. I use this method on my houses and the process of entering my home including detect hidden is so fast you don't even notice the table barrier is there. Hope this helps someone. Tip: Don't macro in your tower. I'm trying to raise the z axis of the table with cloth so the table blocks looting on the other side of the barrier wall.. when I lock down the table, I can no longer remove the cloth. What am I missing here? How do I lock down stuff on the front step (ie, key ring)? Some items, when locked down at particular heights, prevent removing other items under them. Best course when this happens is to place a fishsteak or similar as the 2nd to last item, lock it down and remove everything under it, lock down the item above it (the table in this case), then release and cook (heating stand) or eat the fishsteak. Place 3 tables then the keyring and lockdown. If that doesn't go, add a fishsteak or two on top, then the keyring. Using a ballot box has always prevented someone from taking stuff from the other side for me, i think the table info is outdated. Burglaries are typically a crime of opportunity. Burglars rarely target specific homes-not like armed robbery where these crimes are typically a carefully thought-out selection process. Breaking into a home is simple; choose a home that is vacant, offers easy access, and has a good escape route. Well, that was surprisingly accurate for a spam post. Im trying to replicate the issue where people can loot tiles right next to the tables if the tables arent raised up by one (using the cloth) but I cant seem to do this. No matter what I cant loot items on that "not safe" tile. Can someone explain? 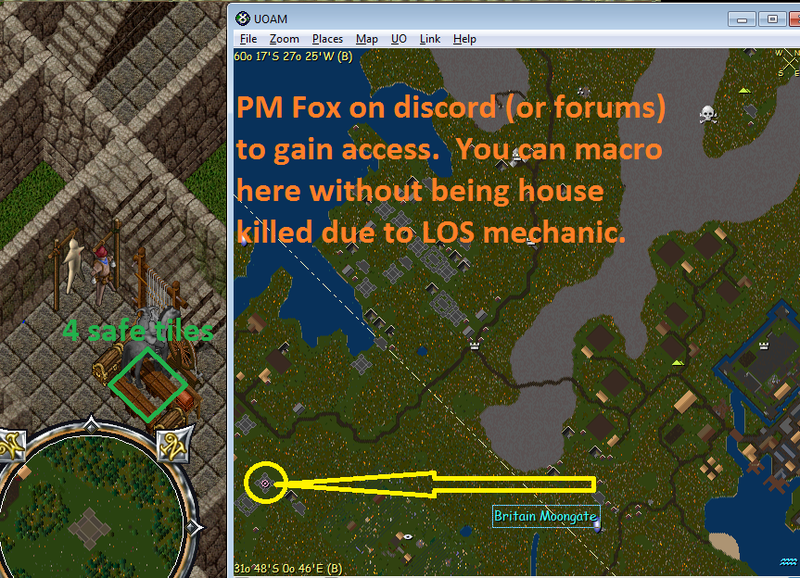 Might have something to do with a macro or loot agent from Razor that lets people do it. I'm not sure; this is just what I've heard swirling around. I would just not even put lootable stuff on those tiles. If you are in desperate need of that space, then me thinks its time to farm some gold and upgrade your home. How do I lock down keys on the wall inside the house ? I tried 2 tabes, 3 tables, with or without 1/2 books (then the keyring), I always get the message "You cannot lock this down here"
If it makes a difference, I have a 2 story house. [EDIT] Actually nevermind. I just had to leave a full square available (ie: not closed to the door on either side), then it worked as well as the front door. I'm well aware of the timestamp of the last post in this thread, but as the poster in the quote above, I'm having trouble lifting item from a chest behind unraised table barrier. 2. I tried using razor restock macro to lift/take the item to no avail. 3. I tried using razor scavenger agent with the same negative result. So my question is has this been changed / patched, or is there just another way to take items from a container directly behind a table barrier? Thanks! I don't believe there was a change/patch for this. Your going to have to unlock whatever and pass to get to the stuff. This is a small, right? Pardon my ignorance, but I have no idea why would you ask me if it's a small. Yes I use a my own small for this test but I fail to see the relenvance of it. It's just I was under the impression that a single row of unraised tables (aka unraised table barrier) has a security flaw in that the space directly behind it can be looted. (In this case my own locked down chest directly behind tables in my own house.) Also, I thought this has lead to the rise of advanced table barrier security, in which case the tables were raised by locking them up higher to effectively make the space behind them safe from looting. My question stands. Why would the original poster claim the space is unsafe? How can this space be looted?